Sew…I had my house party for Singer. No offense to Singer and their customers but the Confidence Stylist was not my cup of tea. I will stick to my Viking that is 40 years old and made with metal parts. I trust it and it likes me. Anyhow, I have some freebies left over that I would like to give away to some of my readers. 2. An introduction card to Burdastyle, an online sewing community. 3. A discount card for a subscription to Sew News magazine. 4. a personal measurement chart. handy when adjusting patterns to fit perfectly. To enter, tell me the last thing you sewed in a comment. I will pick the winners on June 5th. I say winnerS because I have not 1, not 2, but THREE packages to give away. Good luck friends. The last thing I sewed was some pillow cases I embroidered and some curtains. I sewed some gift envelopes yesterday…does this count? 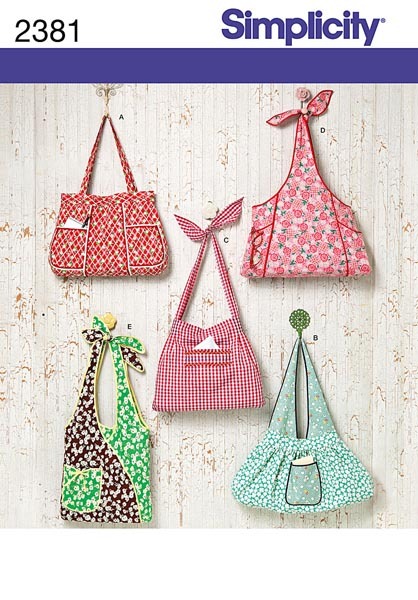 And I've been thinking about sewing some summer bags…your first pattern would be perfect for this!